Two Unit Number Sign for Offices, Suites, Townhomes - - hotel rooms, apartments, etc. Wall mount metal multi address plaque. Made in USA. 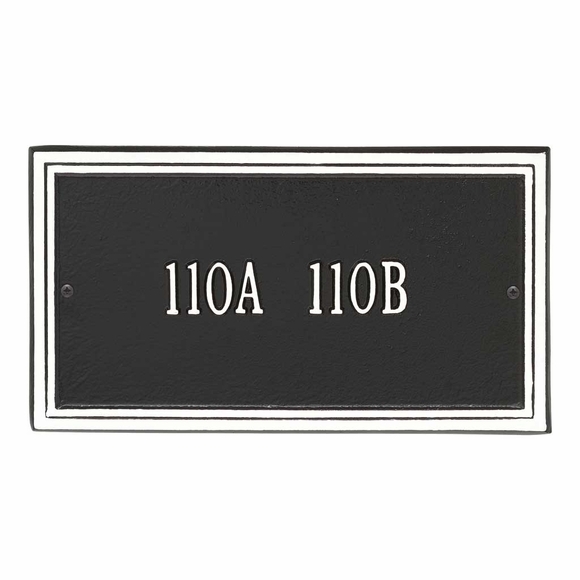 This plaque can be personalized for apartment numbers, office numbers, room, or suite numbers. or with a short word or name or a first and last name. The sign is not limited to two unit numbers. Holds up to six (6) 3" characters or up to eight (8) 2" characters on one line. Bold double border defines the rectangle shape and is same color as the wording. Dimensions: 13" x 7.25" x .375". Double Border Multi Unit Number Sign for Two Townhomes, Condos, Offices, Suites, Rooms, Apartments, etc. Custom made in America.